Following my post 'Thrifty Meal Planning' which wasn't about actually planning at all, here's what we ended up having. Monday - Chicken sandwiches for lunch and pasta bolognaise (with beef mince) for tea. I had to batch cook something that was easy to serve and reheat as we do a quick turnaround on Monday night. It's Crafty B's night! 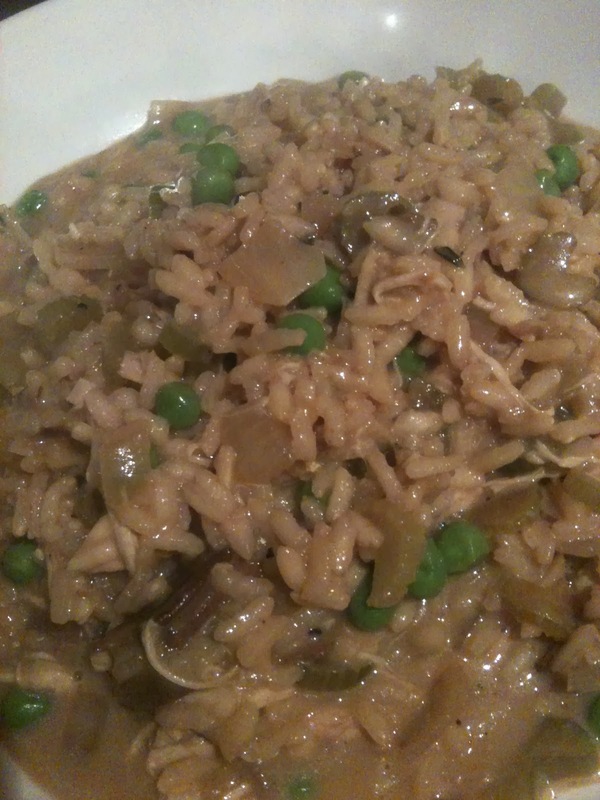 Tuesday - After the suggestion from @bluebirdanielle we had chicken risotto. I used celery and half a bag of porcini mushrooms along with one pot of the stock and it was delicious. Such great comfort food. Definitely doing that again! Wednesday - Chicken and leek pie made with a block of puff pastry. I used the whole lot and made far too much. 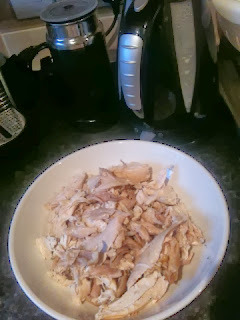 I was wary of reheating but this would easily have fed a family of 4 and then some! Thursday - I used another pot of the stock and the rest of the porcini mushrooms with some other mushrooms to make a soup. We also had chicken sandwiches for lunch. Friday - We ate lunch out and Hubby B ate tea out so we had 'podgy' for supper! This is what Baby B I calls porridge and he is totally obsessed! There was still some chicken left over which the cat enjoyed. Although I haven't done the exact maths, I'm pretty sure there is something in this in terms of money saving and what I made in the week would have gone further to feed more people. I'm going to ask my hubby how he makes his celeriac soup too because that is delicious, cheap to make and it fed four of us on Sunday and me for two lunches. That was six (large) portions. The planning of food and shopping lists at the moment has fallen by the wayside for the last couple of weeks. This is because, as I mentioned, we are big fans of batch cooking. We have several portions of homemade bolognese, pork and beans, chilli, sausage casserole, chicken stew and cottage pie in the freezer along with lots of fish and chicken portions. We tend to stock up on meals for ease during the week but once the freezer is looking a bit empty, I'll start meal planning properly with shopping lists. There are so many tools online which is a great help. Meanwhile I am trying to budget myself with a certain amount each week for shopping. I had to up it by £10 after my initial budget just wouldn't stretch. I did certainly cheat a bit as over the Christmas period, I took advantage of supermarket deals and vouchers and stockpiled things such as juice, cereal, washing detergents etc. I only have to get in fresh things in the week. I feel this is just one part of my 'running an efficient household' that is well underway and I will of course keep you posted. I would love to hear how you do your shopping. Bulk buy or buy as you need? Any thrifty meal ideas? It was recently said to me that it seems that all I do it eat cake, based on my saying that at the start of a few blog posts. The best time for me to blog is when all is quiet and I'm never going to pass up the opportunity for a cuppa and something sweet. So, from the comfy new wing chair where I'm sitting with a cup of tea and yummy shortbread biscuit (naughty) I have logged in to tell you all about my thrifty meal planning. I've realised for a while that although we are very good at cooking in batches and freezing home cooked meals, there is probably (definitely) room for improvement. With ever rising food bills and soon 4 mouths to feed I had a think about the best way to do this. I'm not coming to you with a ready made meal plan but my intentions following a fairly successful day on the food front. Having decided that there is most certainly something in the concept of having a roast and using the meat through the week, I headed off to the supermarket to purchase a chicken. Now, my issues with this are a) it wasn't free range and b) I didn't go to a butcher. Like a lot of people I have a reason behind both of these things but I will put this on my list of things to do better. I really don't like buying not free range and I much prefer the idea of using a local butchers. I used the whole chicken (which cost £5) to make a roast dinner for the three of us (two adults and a 2yo) which consisted of roast chicken, (stuffed with garlic and onion and seasoned with sage) honey roasted parsnips, carrots, broccoli and roast potatoes. I removed the remainder of the meat from the chicken (pictured in a large dinner plate sized bowl) which will be enough to make at least two more meals this week and possibly a chicken sandwich or two for lunch. At this point I decided that you must like chicken to cook like this! I then put the chicken carcass with the garlic and onions in a crock pot with a carrot and onion, meat juices, water left over from the vegetables and water to fill to pan and brought it to boiling point. I the left it to simmer until it had a nice colour. I think it was on a low heat with a lid on for 1.5 hours. once strained, I filled up three old plastic soup pots with stock. 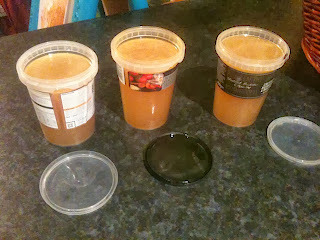 I will freeze two of these and use another on Thursday to make a soup. We usually eat a light tea on Thursday after Hubby B has finished at tennis. I don't yet have any particular plans for the chicken which I'm aware isn't very good planning but I'll keep a note as I go along. My intention is to total up the ingredients and create a relatively cheap shopping list. Wish me luck! Oh and please comment with any simple chicken recipe ideas! Well, the festive season is almost over and most of us have returned to work and our daily routines. For us here in the B household, that is on Monday 6th so our family festivities will continue through till then with lots more snuggling on the sofa, watching telly, playing with new toys, scoffing our way through the copious amounts of chocolates and biscuits left over from Christmas and avoiding taking down the Christmas tree! As I look at my blank 2014 calendar with a list of things to fill in just 4 days into the year, I have a feeling there will be lots of things to report on in the next 365 days and a lot more projects to put in my craft bag, but not before taking a quick look back over 2013. I started the year with intentions of exploring paper crafts with my new (Christmas 2012) Sizzix machine and taking a look at needle felting. Just before the new year, I found out that I was expecting a new addition to the family. Having suffered a miscarriage in 2012, I fell into a nervous 'don't do ANYTHING' trap not made easier by ridiculously horrible pregnancy sickness. The 9 months of sickness saw me not able to concentrate on much else other than childminding two days a week and looking after my first born. I couldn't even face crocheting! This was bad!! So crafting and blogging took a back seat and I once again found myself in a constant crafty daydream. This led to my new project, Crafty B's. Baby B number 2 arrived in September and amidst the arrival of a new baby, a 21st birthday, a 30th birthday, a craft fair and a Christmas crafting workshop, a little bit of crafting activity resumed but I was left with very little or no time for blogging or socially networking. So here's a summary of 2013. January saw the start of 'Meet the Maker' where my readers could meet the person behind one handmade item which was the focus of the post. (Email mrscraftyb@gmail.com to take part in 2014). In February my blog was one year old :-D and this was followed by a bit of Easter crafting with decoupage eggs, cross stitching and hanging eggs that the children made. I also featured my crocheted chicks which serve as cosies for small chocolate eggs (I'm now taking commissions on these. Again, email mrscraftyb@gmail.com). Then there was a cupcake decorating party, a so far failed attempt at an online shop and crochet tutorials, the start of a crocheted ripple blanket (STILL unfinished), we met Mr Bumble, I took a few commissions on infinity scarfs and I hosted Summer Sharing. I made a wedding gift, cheated on a 60th Birthday cake, won business cards (thanks Deeper Insight), took over the organising of a craft fair, held a Crafty B's workshop and got creative with paper pom poms. There was a bit more undocumented crafting here and there and I had a baby (who sort of just appeared by the way) whilst my blog was taken over and then I took a nice break for Christmas and spent uninterrupted time with my best boys! I can safely say that 2013 was jam packed but I know that there is loads more to come in 2014. I will continue with childminding in April but only part-time because I will be starting to slowly but surely turn Crafty B's into something bigger and better. I cannot wait. I guess my first job is to check out my unfinished craft projects! I hope you all had a fab Christmas, saw the New Year in with excitement and are ready for 2014!